You are here: Home / Health / Running! every other time I’ve begun running I’ve stopped after 4-6 weeks because of injury or simply getting too busy. So far we’ve been going for four months! I’ve clocked up 190km in total, of which 173km are for 2013. That’s an astounding number of km on my own two legs! Well, I haven’t made it this far injury free. Whilst doing the Relay For Life two weeks ago I managed to get shin splints in my right leg. From walking. Took a couple of days off, then ran again and it hurt again. So it was off to the physio. A week off running and exercises. Yay – NOT! The exercises are ok, I don’t mind doing them and am feeling the results from stronger more supple muscles and greater stability, but the no running? That was hard. One of the reasons I’ve managed to keep running so much is because this time around I have a running partner. Emma Grey and I spent 2012 walking several times a week, so bumped up the pace and began running. We’re really good for each other. She slows me down so I run farther, and I push her on to run faster. Between the two of us we get into a great pace that keeps on going. Somehow we manage not to have an off day at the same time. We’ve both had days we didn’t want to be bothered, and the only reason we got out there was because the other person was waiting, just not on the same day. One person who motivates me to keep running is Melissa Fehr. Three(?) years ago she had a bone marrow transplant, and she runs marathons. 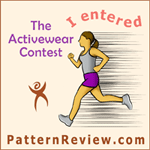 Sews her own running clothes (anyone who sews as much as she does has to be awesome) and accessories. The armband that I’m wearing in the above photo is from a tutorial on her site. The other person who motivates me to keep running is a friend of mine who over the past year has lost more than half her body weight through exercise and good eating. One day she commented how sociable it is to gain weight, yet how isolating and lonesome it is to lose it. So I signed up for a race (Australian Running Festival 5km) to keep her company, then began training with Emma and realised I enjoyed it. Emma and I have both signed up for the 5km Australian Running Festival which is in two weeks. Assuming my legs stay good….. After that we’ve signed up for the Mother’s Day Classic 10km race, and the Sydney City2Surf 14km race in August. One part of me thinks I’m nuts, the other part of me is jumping up and down in excitement!